In my opinion, Blizzard has done an excellent job of selecting the artwork that went into the 2012 Diablo III Wall Calendar. So far, each and every piece that they chose has made me want to know more about it. My curiosity has inspired me to do a series of blogs that describe the awesome artwork that was featured for each month of the calendar. This blog is a continuation of the series. 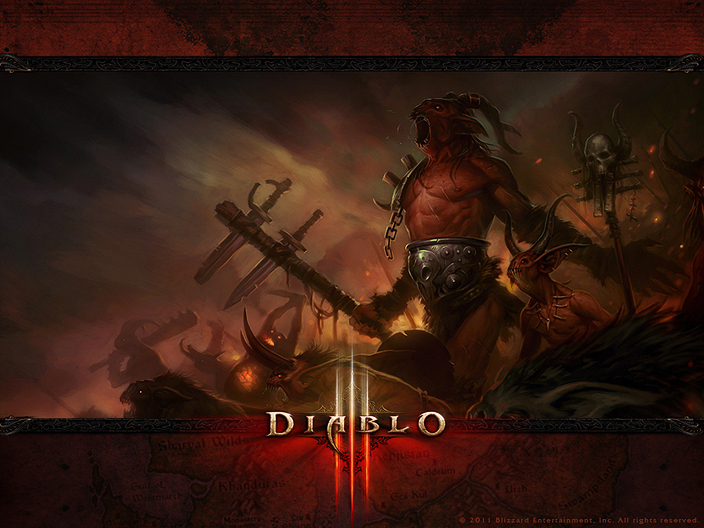 The overall color scheme for the artwork for May on the Diablo III 2012 Wall Calendar was red and black. Accents of orange and yellow, that remind me of flames, highlight certain parts of the scene. It looks like something out of Hell itself, and with good reason. The focus of this piece are several, oddly shaped, frightening looking Demons. Personally, I think the club that has not one, but two, swords stuck through it is an interesting choice of weapon. That’s a creative way to carry more than one weapon after you have run out of bag space! 😉 Why decide between slaying your enemies with blunt trauma or with stab wounds? Now, you can do both at the same time! This particular piece of artwork is available as a downloadable wallpaper from battle.net. It was added to their gallery on December 13, 2011. However, the website Kotaku has a blog post from 2009 that includes this piece of art. That particular blog talks about Blizzard adding the “Fallen Ones” to the Diablo III bestiary. 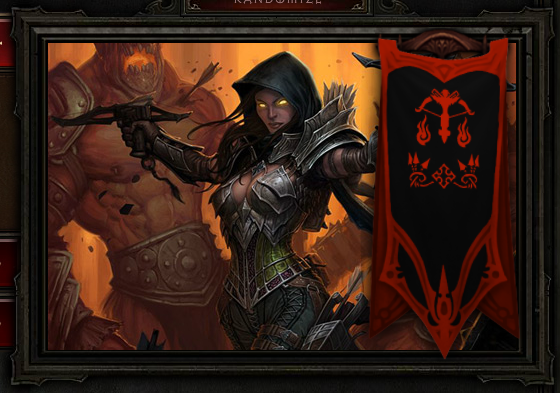 As far as I can tell, the name of this artwork is either “Fallen Battle Portrait”, or “Diablo 3 Demons Attack”. It was, at one time, released as a poster. What are “The Fallen”? The short answer is that they were once demons from the Burning Hells that served Azmodan. He is also referred to as the Lord of Sin. Azmodan is one of the seven Great Evils (but is among the Lesser Evils). Azmodan once tried to use the demons that are now called “The Fallen” to usurp power from Diablo, Baal, and Mephisto, (the Greater Evils), but that plan failed. The result was that Diablo twisted these demon warriors into smaller, even uglier, forms. Azmodan refused to restore them to their original forms, because he felt that they were responsible for his plan’s failure. Players who run into The Fallen in Diablo III will see them in their misshapen forms. It is worth noting that The Fallen also appeared in both the Diablo I and Diablo II games. The Fallen like to swarm, and they travel in large packs. The Diablo III 2012 wall calender contains some seriously epic looking artwork. The quality of it has impressed me so much that I have decided to see if I could learn more about it. This blog is a continuation of the series I am doing about the artwork that is featured for each month in this year’s calendar. March brings us a fierce, imposing, character. This is a large, bulky, male human whose facial expression makes it clear that he is not to be trifled with. That serious, and lethal, look is framed by plenty of dark grey hair that retains traces of its original light brown color. His hair is shoulder length, and free flowing. Yet, someone has taken the time to put his beard into a series of braids. At the center, under his scowling mouth, is a portion of his beard that is unbraided, but still secured. The organic shape of his hair contrasts strongly with the linear scars around his eye and over part of his mouth. The scars do not end there. He isn’t wearing a shirt, and you can see several more scars that look as though they were made by a large, sharp, weapon, (and that have healed long ago). He is wearing armor that has been secured by a thick chain that goes over his shoulder. There is a face decorating the center of the armor, and it, too, is grimacing at you. In one hand, he holds a double-bladed axe. On his back, you can see the hilts of three more weapons. If I had to guess, I would say that those are swords, and that one of them might be large enough to be a two-handed weapon. His other hand is empty, but clenched into a fist. Obviously, this seasoned and battle-ready warrior is a Barbarian. I did some digging, but haven’t been able to find anything that would indicate that this particular Barbarian is supposed to be a specific, recognizable, character from Diablo lore. Instead, he seems be the representative of the male Barbarian class in Diablo III. Before I finish discussing the artwork for March, I want to explain that the image you see of the Barbarian at the top of this page is not, exactly, the same as the one in the artwork for March. The only difference between the two is in how the image was cropped. The Barbarian in the calendar was not as tightly cropped, which lets you see more of him. Not all of him, though, because the calendar artwork cuts him off at the knees. 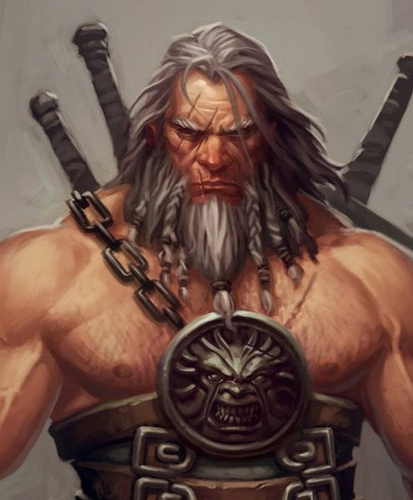 The Barbarian image you see here, and in the calendar, was once released on the Diablo Facebook page. This happened in May of 2010, along with a few other pieces of Diablo III artwork. 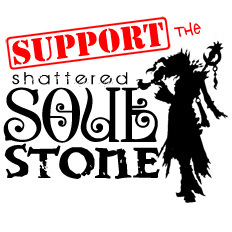 I went to the Diablo III Facebook page as I was writing this blog, but the image of “Mr. March” is not there now. Going back to the artwork in the calendar, it seems that the Barbarian has been superimposed over a background that includes a gold colored sky, and a city that looks to have been built directly into a mountainside. This is the city of Ureh. Ureh is also called The City of Lights. It was first mentioned in The Kingdom of Shadows, which was written by Richard A. Knaak in 2002. I’m not going to do a complete book review within this blog about the calendar art, so, suffice it to say that Ureh was a very significant location in that story. At one point, the city of Ureh was something that Blizzard planned on including into the Diablo III game. In 2009, Jay Wilson said in an interview that they had decided to remove Ureh from the game as a setting, in an effort to try and get the game out sooner. There is something else interesting about the artwork for March. Flip over the calendar, and take a look at the back cover. You will be able to find the Barbarian. However, the art on the back of the calendar shows him from head to toe, and not cropped like he is in the March artwork. The art on the back also shows more of the city or Ureh. I’ve no idea what prompted Blizzard to make changes between the art on the back of the calender, and the art that is featured for the month of March inside the calendar. It appears to be humanoid, which is somehow more disturbing than if it were some less recognizable shape. This creature has a male looking torso, and two human-like, muscular, arms. The arms are deathly pale, which contrasts sharply with the … tattoos, for lack of a better term … that cover the creatures lower arms, wrists, and hands. It almost looks like it is wearing turquoise colored fingerless gloves. The hands end in fingers that resemble talons. Each has a long, sharp, nail on the end. Well, except for the finger that has a portion of it missing. It isn’t easy to tell if the head of this creature is encased in some sort of thick, metal, plate-like armor, or if that is really what its head looks like. If it has any eyes, those are covered by the “helmet”. Rows of razor sharp teeth are exposed in the creature’s open mouth. It makes me think of “Chatterer” from the Hellraiser movies. One can almost hear it shrieking. “Mr. February” might be wearing some sort of pants, that appear to be held on to his body by a series of claw shaped staples. Or, maybe that is just how his hideous body is shaped? Also, I’m not sure if a creature that lacks legs, and whose body ends in what looks like a lizard’s tail, can actually wear pants anyway. This creature is carrying at least five human skulls along with him. Each skull is tied at his waist by a thick, red, rope. If you had any doubt that our “Mr. February” was not your friend, those grizzly trophies should quickly clarify things. What in hell is this nightmarish creature? I decided to try and find out. The first thing I learned is that this particular piece of artwork came from the mind of an artist named Brom. If you are unfamiliar with Brom, take a moment to go check out some of the artwork on his website. He has a style all his own. 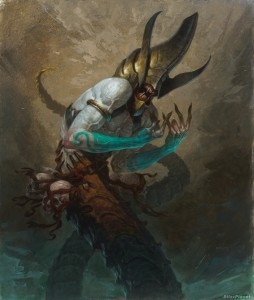 According to the Diablo III Wiki, this particular painting is called “Tomb Viper”, and it is hanging in the Blizzard Campus Gallery. I also learned that Blizzard released screenshots of this painting as a reward for bringing the Diablo III Facebook page to 700,000 “likes”. This happened on March 23, 2011. At the 2009 Blizzcon, there was a demo released of the Monk. At that time, the Monk was the much anticipated, newly revealed, character class for Diablo III. Somewhere in the gameplay portion of the video, (at around 3:40) you can see the Monk destroy several Tomb Vipers. Clearly, the very creepy looking “Mr. February” is a monster called a Tomb Viper. Personally, I love that Blizzard selected this particular piece of artwork for the month of February. Valentine’s Day is in February, and I am not a fan of that holiday. It would be really difficult to find artwork that is less “Valentine-y” than Brom’s Tomb Viper! One of the presents I got for Christmas of 2011 was the 2012 Diablo calendar. The artwork is wonderful, and days of the week use the font style that we, as Diablo game fanatics, are so familiar with. The O in Monday has that cross going through the center of it! After hanging up the calendar on my wall, I took a look at the artwork for January. It shows a male human, who has long, brown, hair, and a mustache that has grown to connect to his short beard. He is wearing what appears to be a green robe, and has a brown, leather-like, cloak thrown over his shoulders. In one hand, he holds a closed, thick, hardcover book. Across the opposite shoulder hangs a leather strap that appears to be attached to another hardcover book. Little square “buckles” attach the strap to either end of the binding of this book. It is as though whomever created the book intended for someone to cart it around like a purse. Attached to the waist of the figure is a green “knapsack”, for lack of a better word, that is either filled with a few more books, or perhaps is stuffed with rolled scrolls. Surrounding this mysterious figure are several loose pages, that may have come from other books. You can almost see the writing on a few of them, but, they are indecipherable. It is a very interesting image of a figure who could be starting a battle with an unseen foe that would be located just off the edges of the painting. At this point, I realized that I had absolutely no idea who this character was supposed to be. This inspired me to do some investigation to see what I could uncover about “Mr. January”. An interesting article was published at Joystiq,com, on April 1, 2009. That date is significant, because it reminded me that Blizzard is known for doing an elaborate, (and hysterically funny), series of April Fools jokes every year. “But the might of these heroes is nothing compared to the power of the archivists of Westmarch. These brave souls wade into battle wielding tome and quill, armored not in ensorcelled plate or links of chain, but in the knowledge of generations past. These archivists fight not only for our future, but our past as well”. His abilities were said to include the “Lorenado”, (a tornado of pages of lore, that can destroy enemies), the “Quest Bolt”, which fired a page at an enemy (and stopped them in their tracks), and an incredibly powerful ability called “Shush”. One “Shush” from The Archivist would completely destroy any enemies in the room, (and, potentially, the Archivist himself). Blizzard went so far as to create a video that showed The Archivist in action. 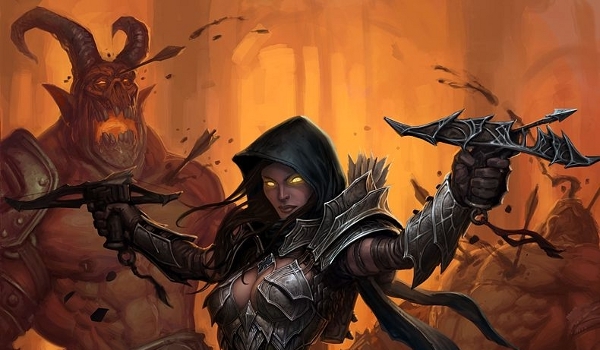 Today, with the release of Diablo III hopefully happening sometime this year, we know that The Archivist never actually made it into the game as a class players could choose to adventure as. 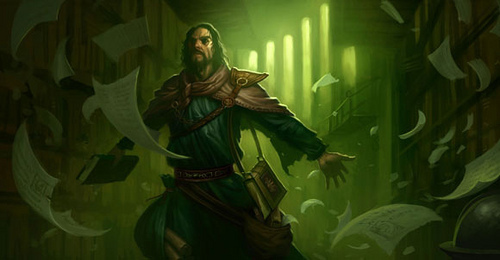 For a while, though, there were players who knew that The Archivist was nothing more than a clever April Fool’s joke, but who kind of wanted to play one anyway.